My series of fashion blogs continues with a look at the walking dress. 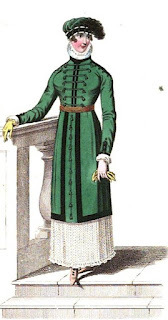 La Belle Assemblée presents us with a picture of what the ton might have worn for those all-important promenades, where the object was to be seen wearing the latest mode of coat or walking dress. 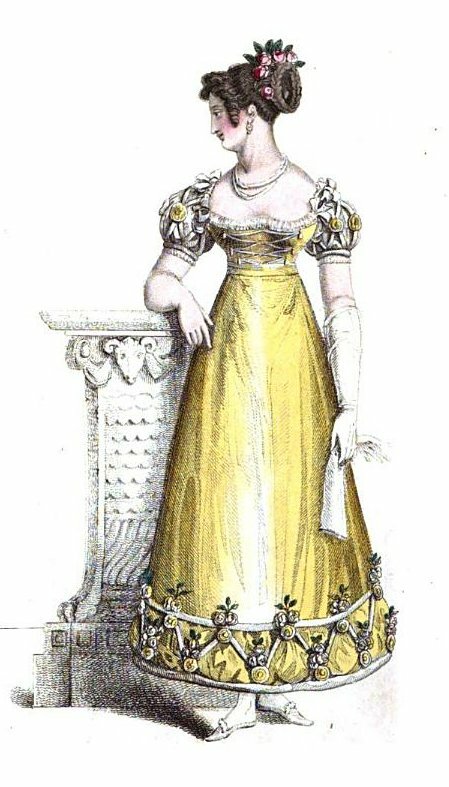 This post looks at the pre-Regency period using plates from La Belle Assemblée from 1806, 1807 and 1810. 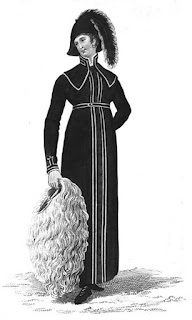 Bedford pelisse and hat, colour, La Bou de Paris, trimmed with fir to match. 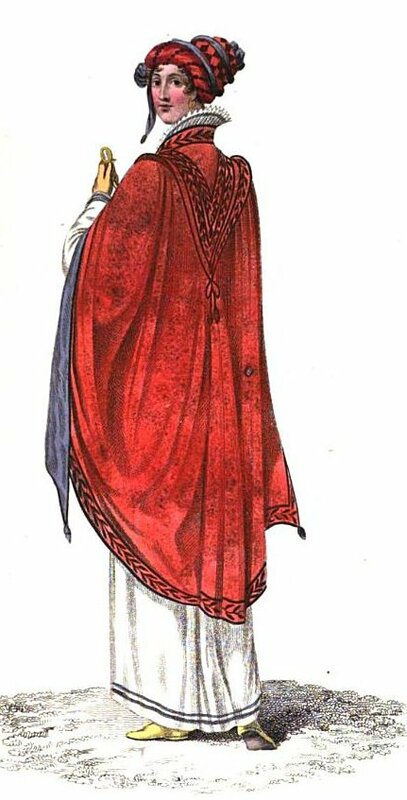 York mantle and hat, seal-skin or Gregorian cloth, edging orange and scarlet, India-pattern. Walking dress, cambric muslin, with work. George IV, The Grand Entertainment, is a very readable biography which presents the events of George IV’s life in a thematic way. The emphasis of the book is a re-evaluation of George’s traditional image as “a knowledgeable and discriminating patron of the arts”. Parissien is able to draw on his own experience as an expert in the field of Georgian architecture and style, as well as recent research by specialists in the history of architecture, art, fashion and politics, to build on Hibbert’s exemplary biography by presenting new insights into George’s life. The book takes its title from the name of an engraving by Cruikshank published in August 1814. The engraving was one of many that ridiculed George. 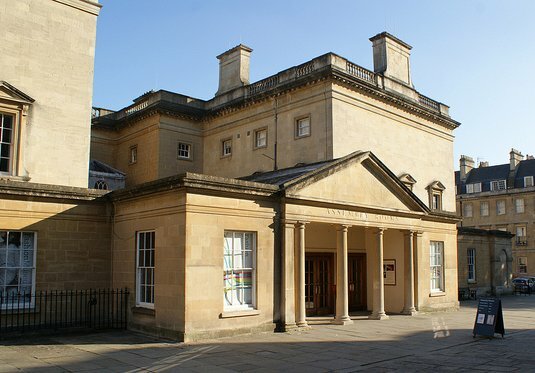 In The Grand Entertainment, he was portrayed as the chief performer in the “Royal Raree-Show”, dancing with his mistress, Lady Hertford, and her husband, in front of Carlton House. 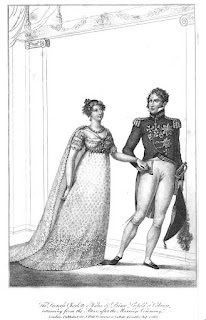 Rather than following a strictly chronological style, Parissien’s book starts with the scene of George IV’s death and then examines the major themes of George’s life under four sections: governing passions, family affairs, the image of royalty and the image askew. 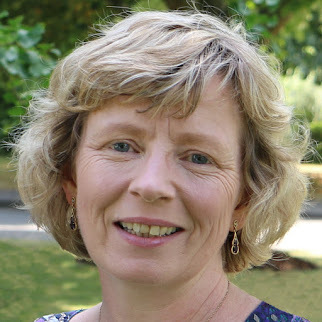 Under governing passions, Parissien looks at the loves of George’s life –women, clothes, building projects, art collecting, food, play soldiering and old French style. The book claims to offer no new information about George’s mistresses, but nevertheless gives a comprehensive chapter on the succession of women in his life. The following chapters are filled with details about George’s other obsessions - from his love of clothes and posturing in military uniforms to his somewhat unfortunate predilection for all things French, even at a time when England was at war with France! The section on family affairs examines George’s disastrous marriage and his relationship with his daughter. 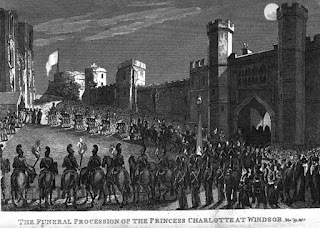 In particular, it highlights the stark contrast between George’s unpopularity and the public grief shown at the premature death of Princess Charlotte, which is likened to the posthumous adulation accorded to Princess Diana after her death in 1997. 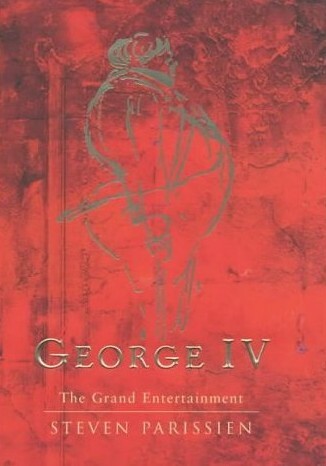 The last two sections examine George’s views on royalty and how these were worked out in practice. 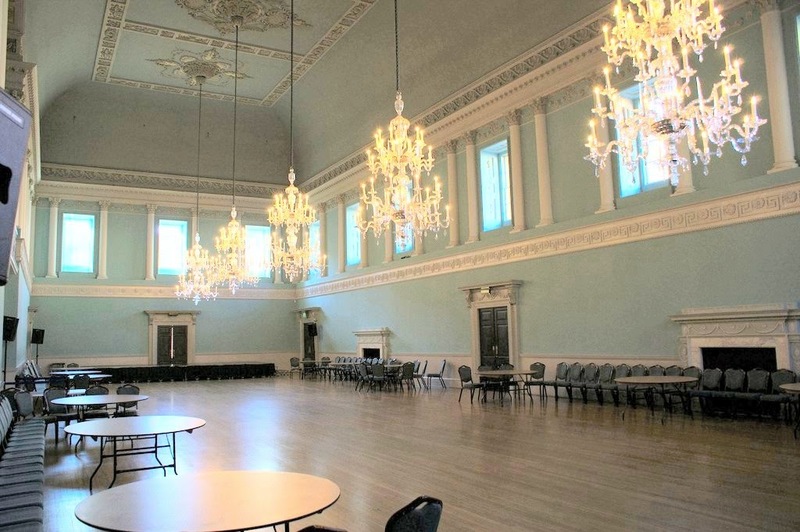 A new aspect, of which I was previously unaware, was the influence of the Freemasons on George and how this served to increase his natural fondness for ceremony and fuelled his lavish architectural projects to build royal palaces fit for a king. The account of George’s extortionately expensive coronation includes details which show that this state occasion was far from perfect and indicate how George was beginning to withdraw from the public he had alienated by his behaviour. What is most remarkable about George’s Regency and reign is not … his role in preserving the status and respect accorded the monarchy, but that it survived his appalling neglect of his office and its responsibilities. 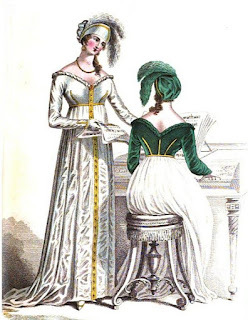 This is the third article in my series of fashion blogs looking at the way spring fashions changed from 1806 to 1827. 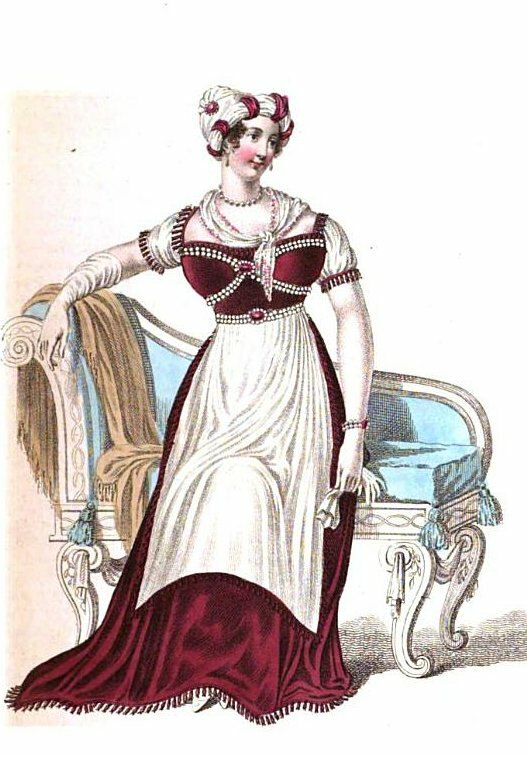 This final post on evening wear looks at the post-Regency period, from 1820 to 1827, during the reign of George IV, using fashion plates from La Belle Assemblée from 1823 and 1827. “En rouleaux” means in rolls. I have had some trouble deciphering “mancheron”. The first translation I found was handlebars and this did not seem very appropriate! However, “manche” means sleeve and I found a reference to “mancheron” meaning a small, short sleeve or an ornamental trimming on the upper part of a sleeve. “Bouillonnés” means ruffled or puffed. 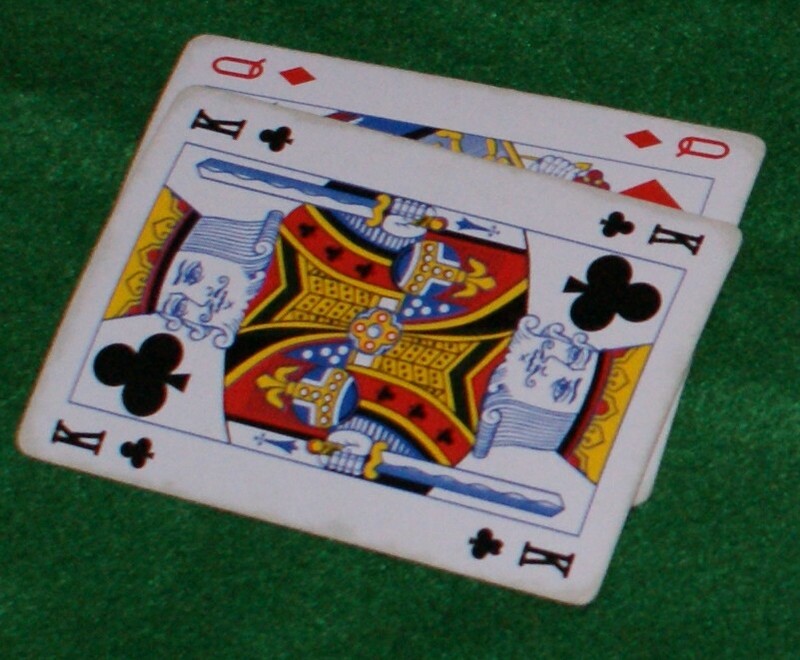 “Fers de cheval” means horseshoes. This is the second in my series of fashion blogs looking at the way spring fashions changed from 1806 to 1827. Continuing the theme of evening wear, today’s blog looks at the Regency period, from 1811 to 1820, using fashion plates from La Belle Assemblée from 1811, 1812 and 1816. Amaranth is a reddish-rose colour; cinnabar is a bright red colour tinted with orange. As expected, in common with the pre-Regency period, the dresses remain predominantly white. Many varieties of the colour red are popular throughout these designs: crimson, maroon, amaranth, cinnabar brown, ruby and scarlet are all mentioned in the details above. 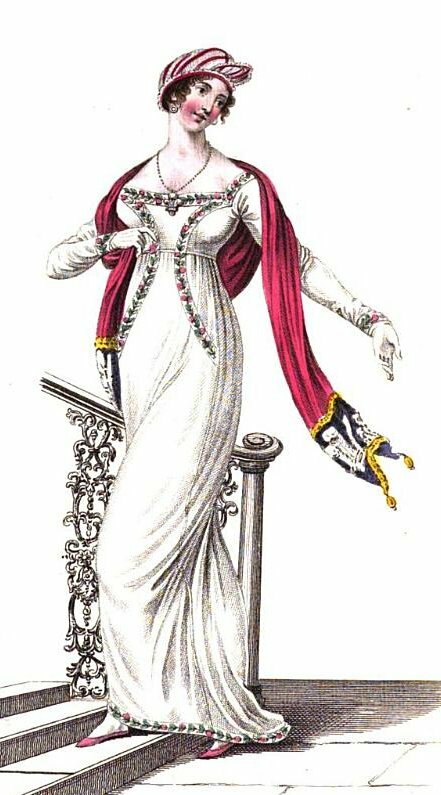 At the beginning of the Regency period, the sleeves are long; by 1816, they are “very short”. 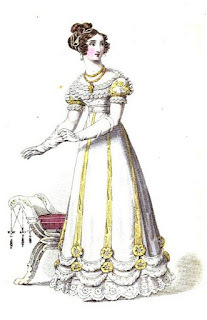 The last dress is much more detailed than the previous two and seems to herald the advent of the move away from Regency simplicity to the more elaborate designs and fuller skirts of the late Georgian period. The fashion plates in La Belle Assemblée are widely admired for the insights that they can give us into the world of Regency fashion and beyond. Individually, they are both attractive and informative; collectively, they illustrate the way that fashion has changed over the years. 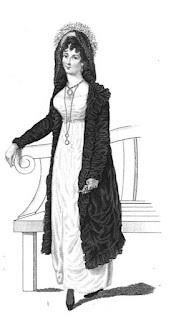 This series of blogs follows the way spring fashions changed from 1806 to 1827, by looking at particular elements of fashion in three time periods: pre-Regency, Regency and the reign of George IV. My first blog is dedicated to evening wear in the pre-Regency period. A tucker was a ruffle attached to the neck of a gown to infill the neckline for a more modest look. Twill is a fabric known for its diagonal weave. The predominant colour of all these dresses is white. The gowns relied upon the trimmings and accessories and, in one case, the bodice, to bring colour to the outfits. The earlier two plates show short sleeves and long gloves; by 1810, the sleeves were long. 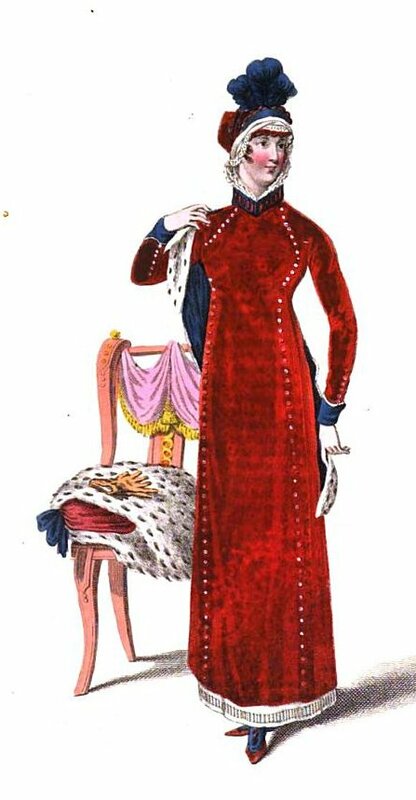 The dresses are in the Empire style, with high waistlines and the material falling loosely below. 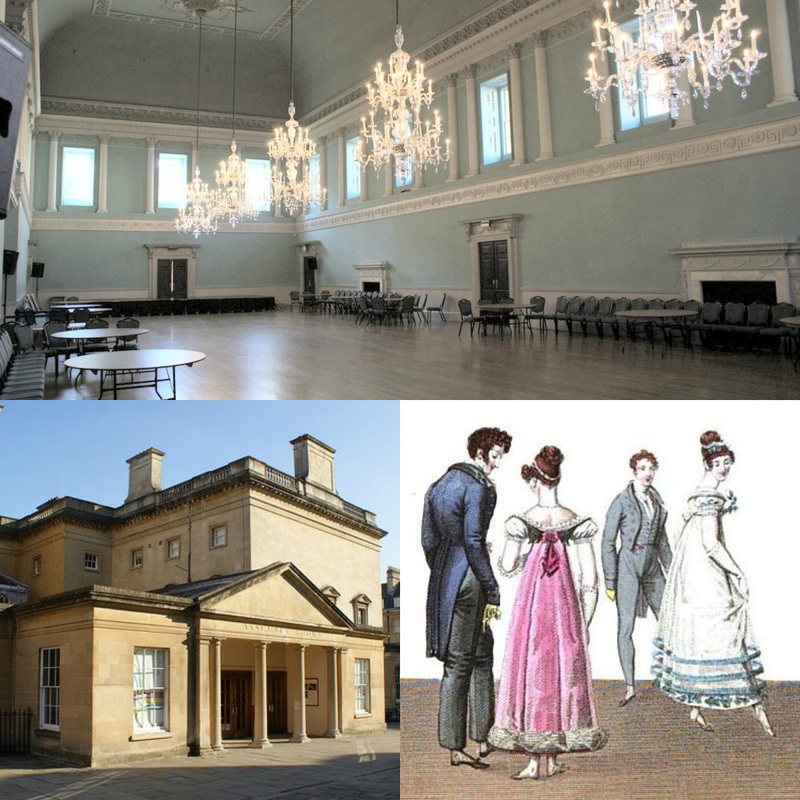 How much did a ticket to a Regency ball really cost? 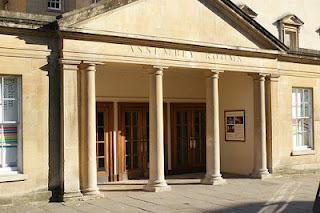 While researching my posts about the Bath Assembly Rooms, I found a list of subscription rates in a contemporary guide. (1) I discovered that a season’s entry to the 28 dress balls being held in the 1815 season cost 14 shillings per person, a gentleman’s annual subscription to the reading and card room cost a guinea and a lady’s subscription to the card assemblies cost five shillings. Tea on ball nights cost an additional sixpence. But what was a guinea? Was it worth more than 14 shillings? Was sixpence really the trivial sum that I assumed it to be? And how much would this be in today’s money? The main denominations were pounds, shillings and pence. There were 20 shillings in a pound. 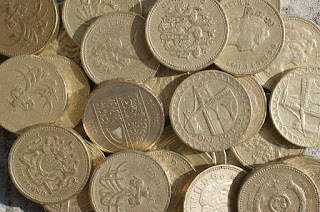 Pounds were denoted by “£” or sometimes by “l”, standing for libra—a pound weight in Latin; shillings were denoted by “s”. There were 12 pence or “d” in a shilling. The “d” stood for denarius, a small Roman coin. A crown was worth five shillings; a half-crown, two shillings and sixpence. The value of a guinea varied according to the price of gold, but by 1815, its value was fixed at 21 shillings. This tells us that a gentleman’s annual subscription to the card room cost half as much again as a single person’s entry to all the dress balls for the season, but gives no indication of what amount this was in today’s money. This is not a straightforward question to answer as there are many factors involved in translating prices from one time period to another. Not only prices, but income levels have changed. What seems like a small monetary value to us could represent a huge proportion of someone’s income back in 1815. I have found the MeasuringWorth website (2) very helpful in understanding the relative values of commodities and incomes from the Regency period compared with today. They have researched alternative ways of comparing relative worth between different time periods and have used historic data to create calculators to enable us to compare the cost of something in 1815 with today’s prices. When Regency prices or incomes are quoted in books, a second figure is often included representing the amount 'in today’s prices'. This comparative amount is typically based on the retail price index (RPI). The RPI, or cost-of-living index, compares the cost of purchases of a typical household in 1815 with the cost in 2015. It is possible to get an idea of what something would have cost in today’s money by using this measure. Subscription to the dress balls: 14s = £46.76, equivalent to a mere £1.67 per ball! Gentleman’s annual subscription to the card and reading room: 1 guinea = £70.14. Subscription to the card assemblies: 5s = £16.70. Though interesting, these results are not as helpful as they could be, because they do not give any indication as to whether these sums were within a person’s means or not. To include a measure of affordability, it is necessary to look at relative earnings. This is important because average wages today are higher than in 1815. For example, a teacher in 1815 would have earned about £51. (3) Using the RPI calculator, this would be £3,410 in 2015. However, the relative salary of a teacher in the UK today is much higher than in 1815, with a starting salary in excess of £22,000 (4). Subscription to the dress balls: 14s = £511, equivalent to £18.25 per ball. Gentleman’s annual subscription to the card and reading room: 1 guinea = £767.80. 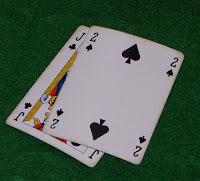 Subscription to the card assemblies: 5s = £182.80. 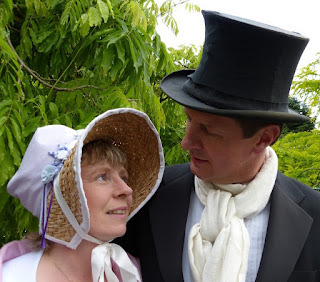 So how much did a Regency ball really cost? A subscription to the dress balls at the Upper Rooms in Bath in 1815 cost 14 shillings, equivalent to 6 pence per ball. 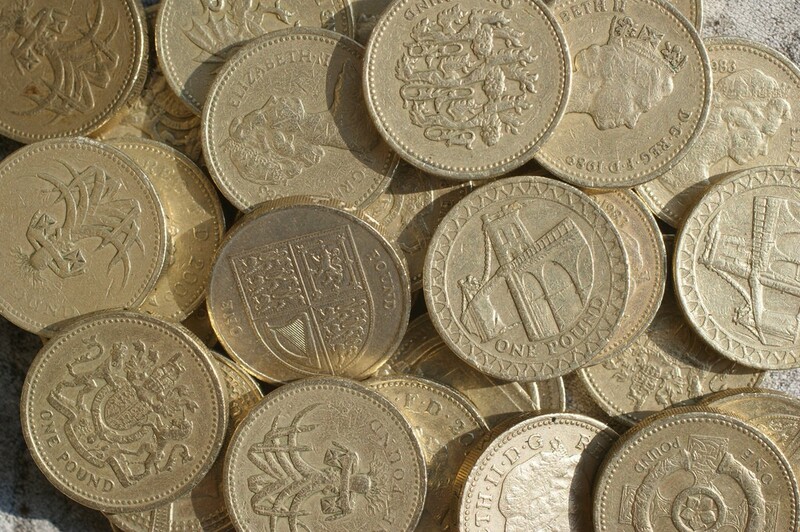 This represents about £1.67 in today’s money. However, I believe that the average earnings indicator can give us the best idea of the real cost, and this measure gives us a price of about £18 per ball. This seems surprisingly inexpensive, though the price is doubled when you include the cost of tea. However, two things should be borne in mind. Firstly, this price was only available if you took out a subscription for the season; a ticket to a single ball for a non-subscriber cost five shillings, equivalent to a massive £182.80! The second is that the relative earnings calculator is based on average earnings. How affordable these things really were would have depended on an individual’s personal circumstances. (1) From Feltham, John, Editor of the Picture of London, A Guide to all the Watering and Sea-bathing Places (1815). (2) All calculations from MeasuringWorth.com. (3) Salary details from Jeffrey G. Williamson, "The Structure of Pay in Britain, 1710-1911", Research in Economic History, 7 (1982), 1-54. (4) Teacher salaries from Department of Education website. In Georgian times, the Bath season ran from October to early June. 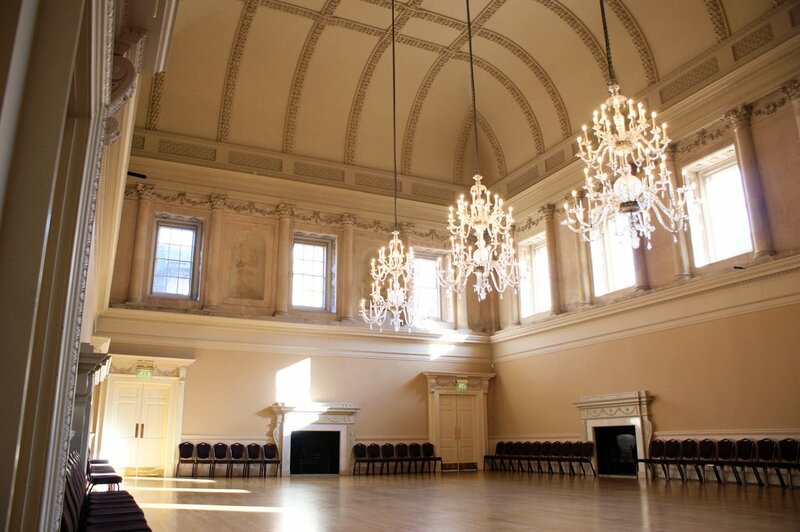 The Upper Rooms held two balls a week in season, a dress ball on Monday nights and a fancy ball on Thursday nights. 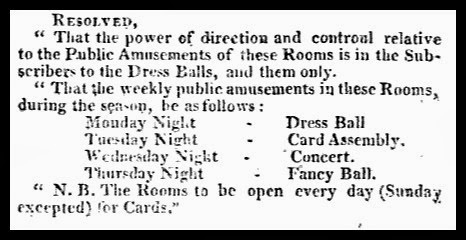 In 1815, subscribers were told they could expect a total of 28 balls on each subscription. However, an advert for the 1811-12 season shows the number of balls as only 24, which suggests that the number being offered varied from year to year. 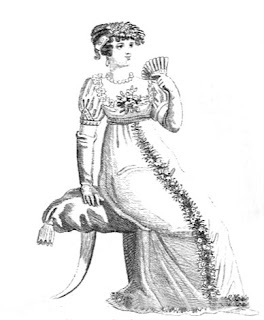 In 1815, a subscription to either the dress balls or the fancy balls cost 14 shillings per person. 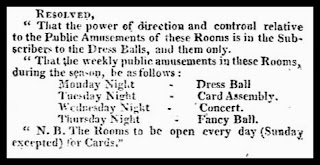 Alternatively, you could purchase a subscription to the dress balls for 26 shillings which included two tickets for ladies, which were transferable. Non-subscribers, on the other hand, were charged the sum of 5 shillings for a single ball. 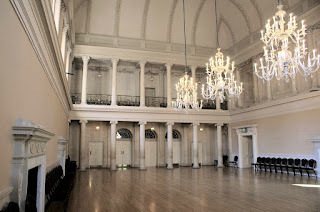 According to the 1815 guide, A Guide to all the Watering and Sea-Bathing Places, the Monday dress ball consisted exclusively of country dances whilst the fancy ball included two cotillions, one before and one after tea. In the height of the season, the 1815 guide suggests that there were generally 12 sets. Mr King’s rules stated that “the Dress and Fancy Balls shall begin as soon as possible after seven o’clock, and conclude precisely at eleven, even in the middle of a dance”. 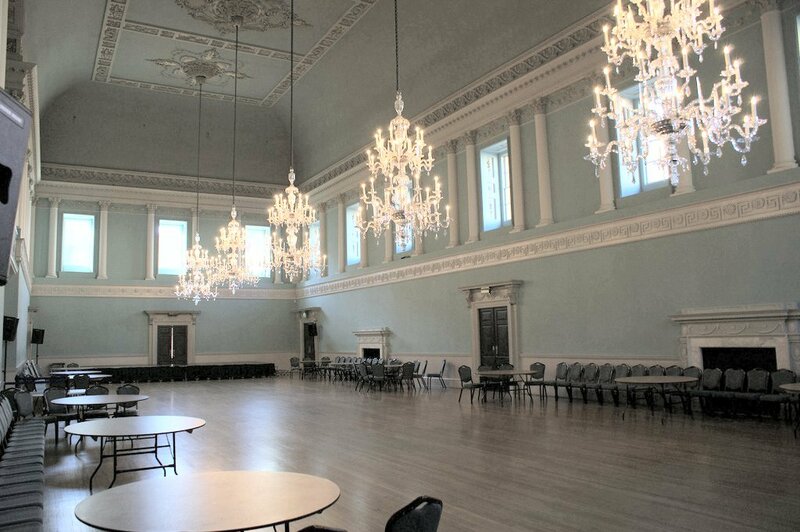 The musical band in the rooms was to consist of twelve performers including the harp, tabor and pipe. 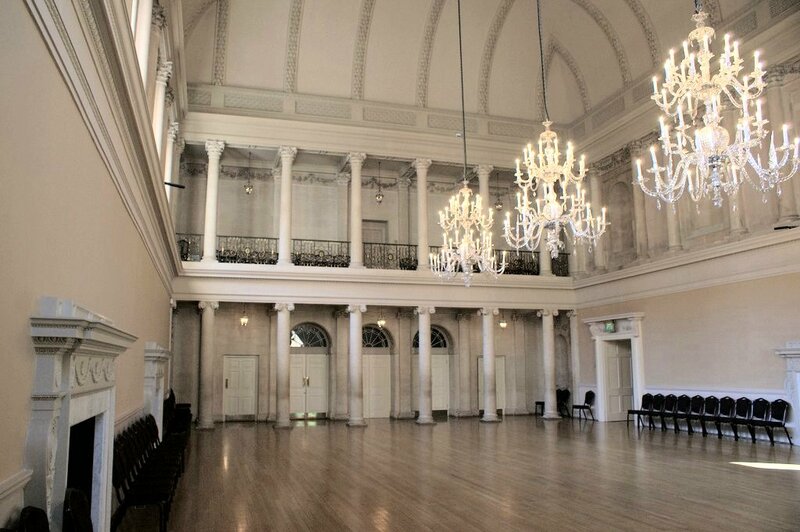 It seems likely that there was some variation over time as the The Assembly Rooms, Bath, the Authorised Guide gives a slightly different account. 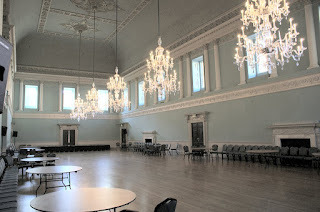 It says that the dress balls began at 6 o’clock rather than 7, and that there were only eleven musicians, who played from the first floor gallery. 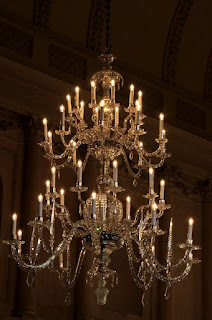 The ball consisted of two hours of minuets, followed by an hour of more lively country dances until tea at 9 o’clock. More country dances followed until the evening’s entertainment finished, promptly at 11 o’clock. 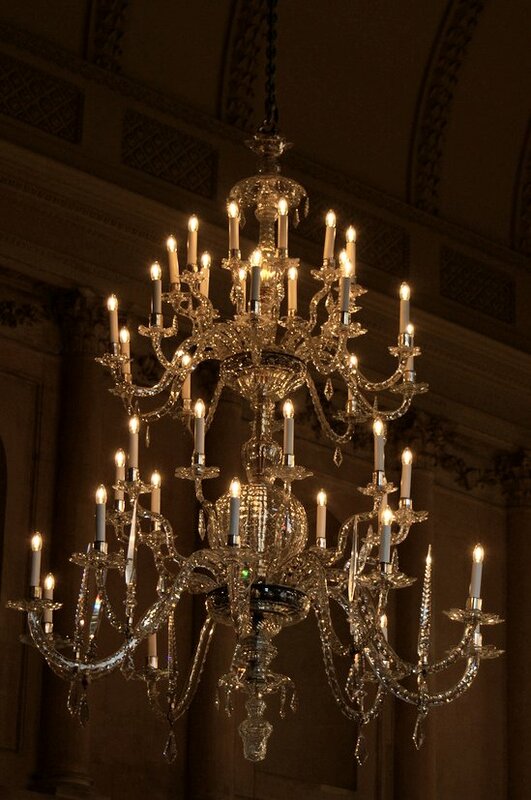 On ball nights, everyone was required to pay an extra sixpence on entrance for tea. Supper was served in the tea room.